When using Salesforce to run your organization, there comes a point where the complexity of your implementation may cause your users to complain, or sometimes even stop using your system. Over the last fifteen years I have heard so many complaints about business applications that point back to an issue of complexity. The first reaction is typically to look for a reason as to why these complaints exist. Was there not enough training? Are the end users resisting change? 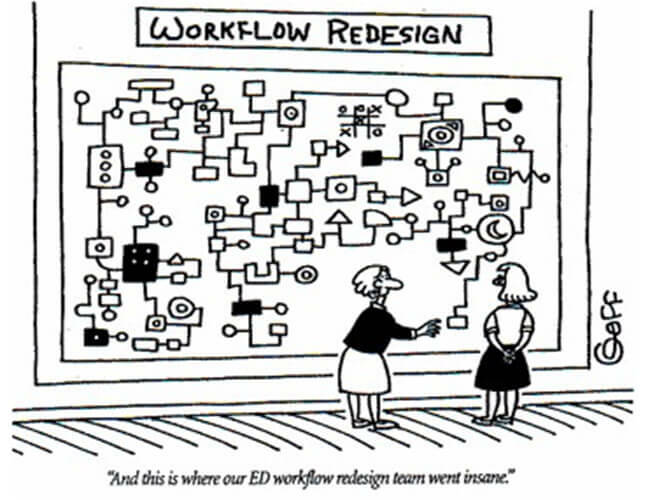 Did our implementation team do what they needed or were asked to do? All of these may be valid reasons aiding to the issues. But more often then not, the core reason for the complaints, misuse and sometimes non-use is quite easy – you have a complicated Salesforce system. To assist with simplifying your Salesforce, I have compiled a list of three steps that your organization can go through. A note of caution though; this is not an easy task for any organization small or large, and should not be undertaken without the full buy in from all employees of your organization –from the CEO down to the newest intern. There will be many heated debates, raised emotions and pots of coffee during this process. But the end result is well worth it in the end, I promise you. 1)Define what key goals are important, then repeat, and repeat again. Every organization, profit or non profit, small or large, start up or mature company, have corporate goals or a mission. However, these main requirements for the success of the organization have varying levels of granularity, and each have varying levels of successful adaptation to a technical application. As an example, let’s try and answer the following question. Which goal is easier to quickly and efficiently measure using Salesforce – The eradication of cancer from our society or Gain five new key government or health care officials to take a leading role in the advocacy for larger cancer funding from the government per month? While both are valid missions (one at a higher level,one at a specific/tactical level), the latter goal is one that is much simpler to report and gauge your success rate. So, how do you properly define what is important so that your Salesforce is less complex? First and foremost, you need to spend the time to take your high level mission/corporate objectives and really work at breaking it down to specific and measurable goals that are easily measured and managed. This process takes multiple passes, with the final question at each pass being “Can this goal be broken down further?”. If the answer is yes, you need to go through the process again. What key metric (from point #1) does this field measure? Is this field used in reports or list views? If the answer to any of those questions are either “No” or “I don’t know,” then that field is an extra field not required that is taking up space and causing confusion. I would seriously question why you have any field that does not measure towards your key goals, is used for reporting, or is unique. Along with this, you can also (if you have Enterprise, Unlimited or the Performance Edition – sorry to PE and GE users) use multiple page layouts for groups of people to ensure they only see the fields and related lists that they need to. If you have financial information that is a rollup of year-over-year donations, but only finance and executive users need or wish to see this information on the record, then use multiple page layouts so that non-finance and exec users don’t have the field on the record (note: we haven’t touched field level security, so this information would still be available on reports if they so desired), and finance/exec users do. The driving goal with this step is to minimize the confusion created by fields that are available to your end users, that are either not required or are used by another group within your organization, but doesn’t need to be seen on the detail record. Salesforce will then be where pertinent information is easily entered, without confusion or time concerns. 3) Use formula fields to populate and calculate. In Salesforce, formula fields allow you to use different fields along with expressions and numeric values to calculate a separate field value on the record. As an example, if a person within your system has a specific definition based around their annual donation level ($0 is known as “Prospect,” $1 – $100 donations is a “Friend,” $101 – $1,000 is a “Patron” and more than $1,000 is a “Founder”) you could use a formula field to look at the total amount of donations a contact has made within the opportunity, and set a field called “Donor Level” to the defined value. Formula fields can be created by administrators, and are written in a language similar to that of Excel formulas. The topic of formulas can (and have) to be covered by a blog post unto itself; a great supplemental read for beginning formulas is the Salesforce article Examples of Advanced Formula Fields. Hopefully with these three steps, you’ll be able to simplify what Salesforce is used for, how the data is presented for viewing and entry, and what you can automate based off of the information you’ve placed into Salesforce. Along with that, you can (for users of Enterprise Edition and above) use page layouts to ensure that different groups of people can see just what they need to see; no more and no less. And with this, you have a Salesforce system that is easier to understand and enter data into, and is configured to report on what it is important to your organization without major issue. Have you completed other steps to decrease complexity within your Salesforce? I’d love to continue the discussion with you! Feel free to leave a comment, and we’ll continue to discuss.